Home » Green & Natural / Simple Living » Hanging Bags of Water… Do They Really Keep Flies Away? In a book I was reading recently, one of the main characters was hosting an outdoor party… and his preparations for this party included matter-of-factly filling clear plastic bags with water and hanging them from low tree branches. No reason was given but it was something I had never heard of, so I did some searching and discovered that many people believe that the hanging bags of water will keep flies away. It was an interesting idea, but I didn’t think about it again until one day when I was trying to do some weeding around some of my hostas… and getting really fed up with the many horse flies that were buzzing around me. There are always several horses grazing in the field over the hill from where we live. We can’t see them, but we can hear them occasionally, and once in a while a strong odor of horse comes wafting in our direction. When that happens, the horse flies aren’t far behind. Anyway… that particular day when I was feeling inundated by horse flies I suddenly remembered what I had read. I went in the house and filled three clear plastic bags with water and hung them at about eye level on the lilac bushes that more or less surround the hostas. I went back to my weeding not expecting much, and after a while I suddenly realized that I wasn’t constantly swatting flies away any more. In fact, there didn’t seem to be any flies around at all. So did the bags of water do their thing? Or did the flies follow the air currents… and the horse smell… and go somewhere else? What is it about the water-filled bags that could possibly repel flies? I have found conflicting information. Apparently, many, many people do believe the bags work, and hanging bags of water are common sights in restaurants and other public places and homes in some areas, especially in the South. Some people add a penny, or four pennies (why four? ), to each bag of water, or slivers of foil. In the book the character added a tablespoon of oil. Some people think the flies are frightened away by their own magnified reflections. Another theory is that their sense of direction is disrupted when light is refracted through the water in the bag, and they become confused and fly away. Some people believe this method works with mosquitoes too… others do not. Of course, then there are the people who completely discredit this method and insist that it not only doesn’t work, but that the hanging bags of water actually attract more flies to the area. Supposedly scientific tests have proven the method to be worthless. The skeptics insist that if the method seems to work it is because of some other factor. So does the hanging bag of water repel flies… or not? I have tried it three times now, once for flies and twice for mosquitoes. I’m surprised… but it does seem to work. We saw these in Atlanta last summer when we were visiting my husband’s cousins and they explained to us what their purpose was. I can tell you – these cousins certainly believe in the effectiveness of the bags. They had them just outside every doorway and several on the porch. I must admit I didn’t see any flies during the 2-weeks we were there. 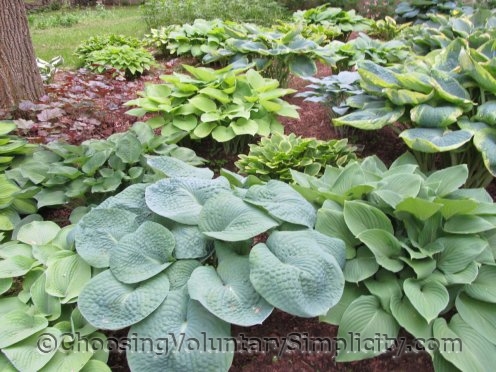 Before I say anything about the bags of water deterring flies let me comment on those hostas in he photo and the other hosta photos throughout your blog. They are stunningly gorgeous. What do you do to grow these incredibly beautiful hostas? That’s just a rhetorical question. I know you work very hard on your gardens and believe me it shows. But back to the flies. A neighbor who moved here from the South introduced me to this method of repelling flies and we routinely have bags hanging here and there during the summer. I’m one of the believers. I have little kids and dogs and cats and I won’t use spray or poison so this post really interested me. We have horse flies too from a neighbor with 3 horses and they are nasty and big and I hate them. I certainly will give this idea a try.